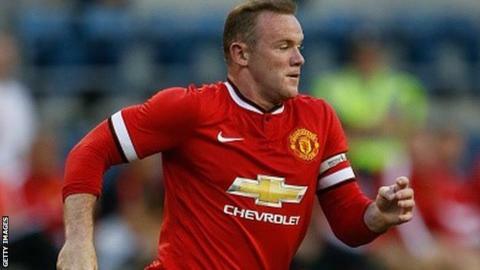 Manchester United manager Louis van Gaal says he plans to use Wayne Rooney as a central striker next season. Rooney, 29, was used in midfield for much of last year. "I have listened to you," Van Gaal told journalists. "You have more knowledge than I. Now Rooney is there." On the possibility of a surprise signing, the Dutchman added: "He is in the process. It is not a striker that the media has written but you have to wait and see." Van Gaal was speaking before the second game of United's United States tour against MLS side San Jose Earthquakes (04:00 BST, Wednesday). Rooney last operated as a main striker in the 2011-12 campaign, when he scored 34 goals, his equal-highest personal haul. "I hope to score 20 or more goals again," said Rooney. "If I'm playing as a striker, then I will be disappointed if I can't do that again. "I've played different roles over the years for United but you only have to look when I play for England as a striker I score goals." Van Gaal said goalkeeper David De Gea and full-back Antonio Valencia were unlikely to be fit to face San Jose after having hospital checks on Monday morning on the minor injuries that kept them out of Friday's win over Club America. However, De Gea is expected to be available to play against Barcelona on Saturday. "He can also fall off the stairs." "I could not expect more. He is a great captain. Better than I had expected. He is fully accepted by the players. That is also very important. I can choose but the players decide. The players have to accept the captain." "Yes. I could not say that last year. You always have to be positive about your selection as a manager but the difference now is that we already have four new players and we are training with them on the tour. That is a big difference. "But the biggest difference is the balance in the team. Last year on the USA tour I have to line up players in different positions than they are used to playing. That is not good. Now I have two players for every position." "We have sold a lot of players. More than 17 in my period. I never talked about that but it is true. It is normal in the football world. You have to improve the selection every year and also keep them fresh. Also a new player can give a great stimulus." "It is a process. Maybe Mr Ramos [Real Madrid centre-back Sergio Ramos] is in the process. You never know." "The first captain is Wayne Rooney. The second captain is Michael Carrick. Last year the third captain was Mr Mike Smalling. I mean Chris..."